Jeri Smith-Ready: Zachary in the YA Summer Crushin' Tournament! Holy flaming toads, it's hot out there! And what better way to pass the summer days than with hot imaginary guys? 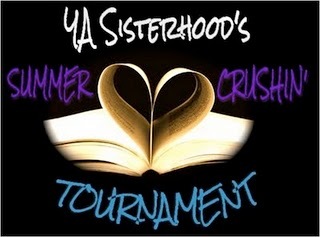 So says bloggers at the YA Sisterhood, who just devised a March-Madness (uh, July-Madness)-style tournament for crush-worthy guys in YA fiction, the Summer Crushin' Tournament! There are some surprising entries, including...Zachary Moore! Okay, maybe not that surprising. If you're reading my blog, you've probably read Shade and/or Shift, so you know he's got the whole Glaswegian dialect and being-alive thing going for him. Plus the kilt. But Zachary is much more than just an accent, a clothing item, and a pulse. Zach is...well, hey, it's not the authors' place to tell you how crush-worthy their boyz are. For that, we have champions! Different bloggers have signed up to argue for their favorite dude. The first two contests, between Puck from Julie Kagawa's Iron Fey series vs. Etienne by Stephanie Perkins; and Nash from Rachel Vincent's Soul Screamers series vs. Hale from Ally Carter's Heist Society series are going on now. (Links: Nash vs. Hale; Puck vs. Etienne). Zachary's champion is Fictitious Delicious, who wrote a lovely review of Shift and a limerick-style ode to Aura and Zach. Best of all, they rate books in terms of food. Books + food = My Entire Life. Being a veteran of the DA BWAHA tournament, I just couldn't stand by and watch my lad get hammered by a character who is apparently more popular than Jesus. No no no! I've learned how to bribe provide incentives. So here's my offer, to ALL of you. For every round in the Summer Crushin' Tournament Zachary wins, I will post...here on this blog...a teaser from Book 3, SHINE...from Ballyrock Castle. So ready your troops! Come Friday and Saturday, vote (apparently as often as you want), spread the word, and support the one who is, as Logan would say, "so f*cking pure of heart." P.S. : If you're wondering why I'm posting this early, it's because on Friday I'll be at Cape Canaveral watching the very last Space Shuttle launch EVER! Unless it rains, in which case I'll be at Cape Canaveral NOT watching the very last Space Shuttle launch ever. P.P.S: "Alba gu bràth!" means "Scotland forever!" According to EVERYDAY GAELIC by Morag MacNeill. NYX in the HOUSE OF NIGHT out today!